ERGO Network was one of the co-organisers of the 2nd EU Roma Week that was held from 27th to 3rd April 2017 in the European Parliament to mark the occasion of International Roma Day on 8th April. Around 200 representatives of public institutions and civil society took part in a series of events dedicated to Roma integration in Europe. The public institutions were represented by DG Justice, DG NEAR, the Fundamental Rights Agency and the European Parliament as well as the Contact Point for Roma and Sinti of OSCE/ODIHR. Civil society was represented by a number of young Roma activists and representatives of the European Roma Rights Centre, the Roma Initiatives Office of Open Society Foundations, ERGO Network, Ternype International Roma Youth Network, The German Central Council of Sini and Roma, the Spanish Fundacion Secredariado Gitano and many more, making the week a very useful space for all stakeholders of Roma integration to discuss their work. A youth advocacy training led by ERGO Network, TernYpe, the German Council of Sinti and Roma and the German Documentation and Culture Centre for Sinti and Roma prepared 40 young Roma advocates to take part in all Roma week events and to advocate for their rights after their return to their home countries. In three working groups focussing on antigypsyism, inclusion and political participation they discussed their experiences, learned about the institutional frameworks and agreed on the messages that they took forward in the debates in the European Parliament. A workshop on strengthening diverse leadership, participation of Roma in public and political life organised by the Contact Point for Roma and Sinti of the OSCE/ODIHR invited participants to discuss diversity in mainstream political parties and decision-makings and draw comparisons between Europe and the US. The participants all agreed that the public narrative on Roma must change to combat antigypsyism, and that this effort must be led both by Roma and Non-Roma. The European Commission’s Directorate General for the European Neighbourhood and Enlargement awarded the 2nd EU Roma Integration Award for the Western Balkans and Turkey to organisations supporting Roma children, youth and young adults. 3 members of ERGO Network, Otharin Bosnia, Rroma acedonia and Mladi Montengero were rewarded for their work. The participants of the award ceremony also took part in a discussion on improving impact of EU funding and Roma integration policy in the enlargement region through partnership with Roma civil society. The Greens/EFA in the European Parliament used the occasion of the EU Roma Week to launch their new publication “Countering Antigypsyism in Europe”, outlining achievements and failures of combating antigypsyism in the EU, outlining problems of segregation and the political dimension of antigypsyism, as well as pointing out the fight for recognition of Roma in public and civic life. A very important discussion on the future of the EU Roma Framework took place in the event “Taking stock of the EU Roma Framework and National Roma Integration Strategies”, with a view to building a post-2020 strategic approach, which brought together all relevant stakeholders to provide input to the mid-term assessment of the Framework as a step for improving the remaining years and for shaping the next programming period. Invited by the Greens and the S&D Group, the European Roma Rights Centre gave evidence on how strategic litigation can be used to challenge racism in court, especially when it comes to forced evictions and school segregation. 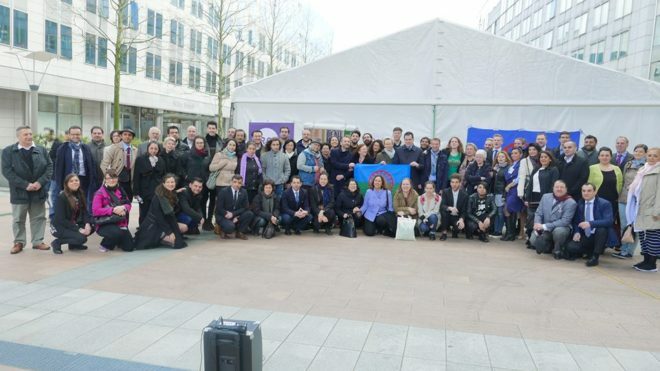 Soraya Post, one of two Roma MEPs in the European Parliament, invited Holocaust survivors to give testimonies of their life and their activism to raise more awareness of the Roma Holocaust and call for a Roma Holocaust Memorial Day. Roma activists from the EU and enlargement countries finally met with Members of the European Parliament and representatives of the European Commission for a working breakfast to bring the voices and visions of Roma youth to decision-makers and discuss their concerns, challenges and realities. They highlighted how Roma youth have become strong agents of change for their communities and how political leaders across Europe can contribute to the fight against antigypsyism. Such an intensive programme of debates and discussions cannot be successful without a good informal time, too. All participants and partners celebrated at the big Roma Week Party hosted by ERGO Network and danced to the music of two Roma bands. We would like to thank all partners involved, and especially the European Parliament Anti-Racism and Diversity Intergroup who coordinated all events, for the common efforts and the good dialogue that will continue in the coming months.